I enjoyed this novel I borrowed as an audiobook from the library. It is written as a first person narrative by a doctor who takes a holistic approach to medicine, in the sense of attending to the psychological or spiritual aspects of a person and not just the physical, though he is also very attentive to that as well. He also ponders the medical ailments of characters from literature. I liked the series of episodes involving different characters as they grow old in Toronto, though I thought it ended a bit abruptly and maybe a little sadly. I have only read one Agatha Christie mystery. I was turned off after realizing I couldn’t have figured out what happened because she didn’t give you all the information. But I liked this graphic version of her life, drawn with simple lines and colouring. They began with her mysterious disappearance, which they ascribe to her response to her husband having an affair. They playfully include her chatting with some of her characters. I had a vague memory of her as a white-haired old woman, so it was interesting to see her as a vivacious young woman with red hair. My Baachan, Taki Nakamura, passed away in 1980, at the age of 91. She lived through many episodes of Japanese Canadian history, but not Redress. After tricky negotiations and more than a little controversy within the Japanese Canadian community, the National Association of Japanese Canadians reached an agreement with the Canadian government, signed on September 22, 1988. This agreement acknowledged the injustices during World War II with an official apology in the House of Commons, individual compensation to survivors of $21,000 each, and the establishment of a Race Relations Board. My parents each received compensation and took our family on a vacation to England. I don’t know what my Baachan would have said about that. As I have said, I never really knew her that well, but she always seemed to be a quiet, upbeat sort of person and certainly never passed on any bitterness about the past, for which I am grateful. By coincidence, 1977 was also the Centennial of the arrival of Manzo Nagano. Here is the logo from those celebrations. I think it is a nice logo the way it combines the maple leaf and the sakura as a symbol of Japanese Canadian heritage. I used to have a T-shirt with this logo on it. These celebrations led to a raising of awareness within the Japanese Canadian community of Japanese Canadian history, which it seems many had not spoken about. 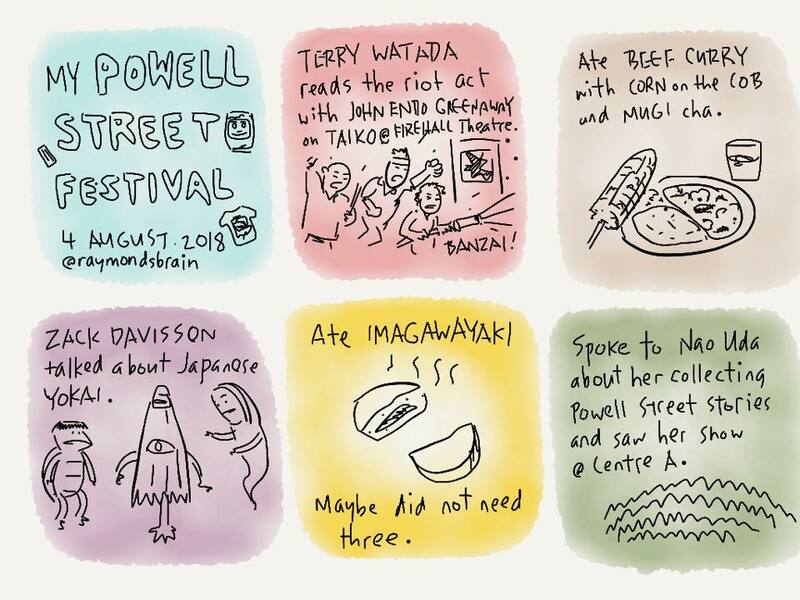 In Vancouver, this was the year the Powell Street Festival began and still continues. My Baachan turned 88 years old in 1977. 88 is a big year as a birthday in Japanese culture because the characters for those numbers resemble the character for rice and signify good things. So we had a big dinner with as many relatives together as possible. At the time, the accounting was that she had eight children, 35 grandchildren and 29 great grandchildren. More people of Japanese descent ended up in Toronto where my Baachan was, but they did not settle in any particular area. Apparently, they still felt the need to feel like a community, even as they assimilated. Through community fund-raising, the Japanese Canadian Cultural Centre was born in Don Mills, Toronto. It was designed by architect Raymond Moriyama and opened in 1964, with Prime Minister Lester B Pearson there. I don't know how often my Baachan visited, but various members of my extended family helped out and we would go for one event or another and judo for a while. The JCCC hosted the Tokyo pavillion as part of Toronto's multicultural Caravan festival and one year I played the mayor. The JCCC has moved to larger building in the same area but this building remains as the Noor Cultural Centre, a muslim organization. In 1951, my Baachan finally got her Canadian Citizenship. Maybe she'd been waiting until it was worth something. They'd only just granted people of Japanese descent the right to vote in 1949. And they actually let them travel to BC, if they wanted to, though for most of them, there was no longer any reason to. Unless you were a fisherman. And my Baachan was not. In 1950, the Bird Commission looked into the scam that was the Custodian of Enemy Property but their findings were mostly for the birds. In any case, my Baachan carried on. My Baachan got baptized in the Japanese United Church in the year she moved to Toronto, so I guess she was committed. I wonder if they usually use these certificates for babies, because it seems a little odd for them to list her mother and father, when she herself was already a grandmother by this time. I’m not exactly sure, but the signature of the minister looks like K Shimizu. 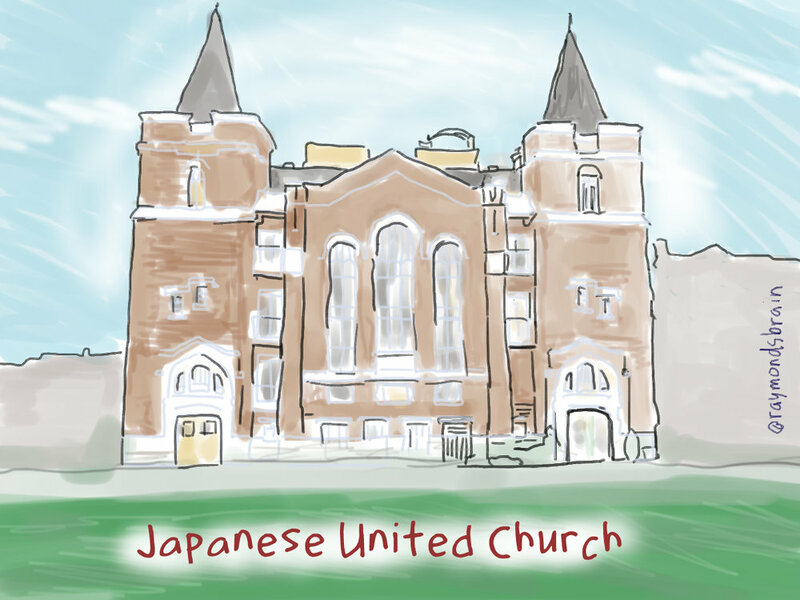 A Kosaburo Shimizu had been a minister in the Japanese United Church back in the 1920s in Vancouver and after the war in Toronto. Many other people of Japanese descent besides my Baachan moved to Toronto. They did not form neighbourhoods as they had in British Columbia, either to avoid making themselves easy targets again and part of a concerted effort to blend in. At the same time, they formed community organizations, such as t he Japanese United Church, which Baachan enjoyed attending. My Baachan and her family moved to Toronto in 1947 where they had heard there were job opportunities. One of her daughters had found work there, and her eldest son was fed up with farming. So they moved to house with her eldest son's growing family as well as some from her daughter-in-law's family. Meanwhile, after sending more than 4000 people to a starving war-torn country, the Repatriation to Japan initiative had been halted in response to public protest, in light of the UN Universal Declaration of Human. The Allied side dropped nuclear bombs on Hiroshima and Nagasaki in August 1945, probably because they had put so much into building them that they had to use them somewhere. Not long after, Japan surrendered. But people of Japanese descent in Canada like my Baachan were still not allowed to return to the coast. Baachan and the family stayed on at Chatham because of contract with the farmer. You may have noticed I already wrote about this in the previous post. I borrowed this audiobook because it was based in Japan and I was curious about it. But it turned out to be even more interesting than I expected, because the main character was a scientist and it took place in a small seaside village. The different levels of jurisdiction and protocol seemed to be very Japanese in its procedures as did the secretive nature of the crime itself, the attempt to keep unseemly matters hidden. The crime rate is very low in Japan but now I wonder how much of that is because people don’t want to talk about things. 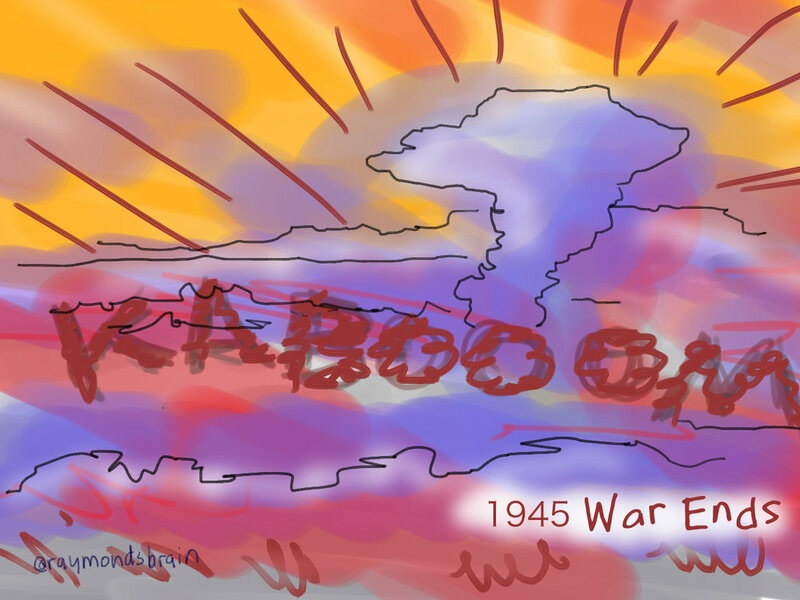 Not long after my Baachan and her family arrived in Chatham, the war in Europe ended and later that summer, so did the war with Japan. But they still weren’t allowed to return to BC and anyway, they had nothing to return to. Many had their properties sold off by the Custodian of Enemy Property, without their permission. So they worked on this farm, which grew many things, such as tobacco as shown in this drawing (based on a 1947 black and white photo taken in Chatham NNM 2010.23.2.4.154), as well as sugar beets. It was hard work, but the farm supplied plenty of food. Chatham had been a destination for the Underground Railroad and they had a significant population of people of African descent, though the restaurants remained segregated. Canadian baseball player Ferguson Jenkins was born here.